We all know Nintendo is a company with a long history. In over 100 years they’ve made everything from playing cards to LEGO sets to video games. But as important as some of those products were (or still are! ), few are as important as the Nintendo Companion. Why? Because it marks Nintendo’s first foray into the world of electronic toys. This humble children’s walke-talkie set is the point where the company’s past as a humble toymaker and it’s future as an electronic gaming powerhouse meet. The excellent Nintendo history blog Before Mario has a couple of units, and estimates they’re from the mid-1960s. 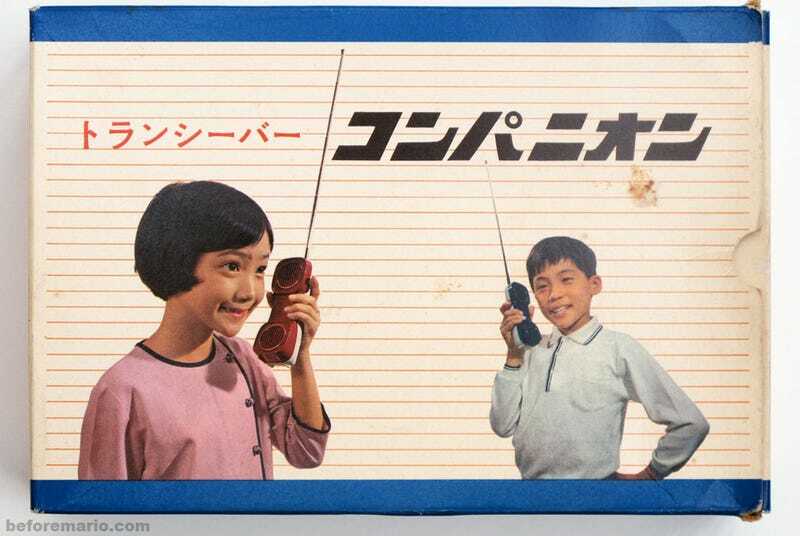 Built in conjunction with Sharp, the package included two handsets, one notable because it’s in a very Famicom shade of maroon-and-gold. The Nintendo Companion (its full name was technically the Nintendo Transceiver Companion) wasn’t produced in large numbers, making it very rare today. But what a prize if you can get your hands on it. The design is superb (dat “Companion” logo, ungh”) and I could look at that box art all day long. This story was originally published in December 2013.